Ugly Tuna Poker Club - Are you playing the WSOP Main Event for the first time? Are you playing the WSOP Main Event for the first time? A friend of mine, asked me for some advice for playing this year's WSOP ME. This is his first time and I offered up some valuable advice. I also would like to share this advice with you. I'll be playing some random tournament and I'll be talking to a friend who I play with regularly. They'll say, Tuna (my poker nickname) you're going to win this tournament! I literally laugh at them, not because I'm coy about the remarks, don't have the confidence or who is he kidding? I'm flattered by those remarks. When registering for a tournament and from the outset, I never say I'm going to win. Those goals are unrealistic. Too much short-term luck and variance can say something about your bottom line. However my objective has always been the same. Play my best and see where it takes me. This might sound so generic or simple but if I play one hand at a time and play my best, just maybe I'll have a shot. Just play optimal and if the deck works slightly in my favor, I might have a realistic shot. The only time I would ever consider possible winning a tournament, if I'm one of the remaining last 5% left in the field. Then I can vision the goal for the task at hand. I can see the light at the end of the tunnel !!! This philosophy truly helps me with my mental state of the game. The mental game of poker is truly under-rated. My mental game is better than most. Beats are numb to me and getting a big stack early means nothing. I'm always reassess my current situation. Not saying I can simply play my A game every time I'm on the felt. Able to detect tilt from the beginning and inject some good logical information to myself allows me to adjust to the current situation. This logic can get you back playing your A game sooner. Money lost on the felt should not bother you nor me. If it does then we are not playing the right stakes or implementing the wrong bankroll strategy. My poker bankroll is not real money to me. It's just paper that allows me to play a poker game. Any winnings I give back to my family is real money. This helps my mental game too. You need to be able to segregate your bankroll from your other personal / family funds. Last bit of advice I would like to offer is a trend that I've noticed over the last couple years. I tend to do better in games when I don't put too much pressure on myself. When I play game carefree I tend to do better. My two biggest live pokers scores to date came from events that I couldn't give two shits about. Maybe because I play higher variance style in them. In a high buy-in event like the WSOP Main Event I've put more pressure on myself. The first time I played in the WSOP Main Event I passed on spots where normally I would take on more risk at a lower buyin. That's not good!!! Maybe I'll more happy to flip for my tournament life with AK after I've be 3B PF. After some soul searching and self analysis I vowed to make a change. So last year, when I played my 2nd WSOP ME, I made a deal with myself. If I busted out the first hand of the tournament I didn't care. I'll get back on the horse again. Can't keep me down. I was willing to accept the result with no regrets. Provided I was playing my best and made the correct/optimal play. Yes I can live with the result and sleep comfortable that night. My new found philosophy had a better result than the first year I played. I was not a deer in head lights like the previous year. 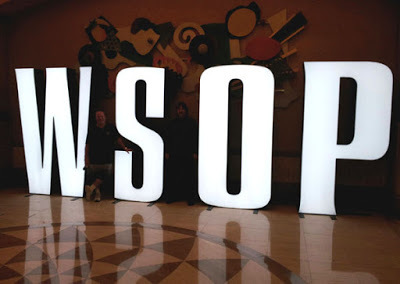 The first year I was so caught up in the electric atmosphere playing in my first WSOP event. This was my first big buyin event and the money and pressure of the event effected me. I needed to block that out. These days I'm getting use to playing in higher buyin events and I'm much more comfortable. This year I'm going to be playing more higher buyin events. I think I can compete and be successful. The last two year the results are starting to show. I'm not easily intimidated at the tables anymore. I embrace the competition and the pressure of the event. I put in the work off the felt. My game is in a much better place than it was even a year ago. This year I'm ready and thankful to give the WSOP Main Event another try. The hoopla around the event will not affect me. I'll be playing this event like a $100 SNG. There's an old saying, "Scared money never prospers". So true !!! I won't be scared money and I'll be happy with my result, good or bad. When conditionals are right I'll opt for the aggressive decision over the safer route. I'll thin value bet more. Call more when the odds are good. The first WSOP year I played, I played not to lose and that was a recipe for disaster. Patience, position, aggression and confidence is the recipe for success in today's game. I know I have the ability. Just play my best and maybe I'll be able to put together a deep run together. If you're playing in this year WSOP, Good luck !!! My message should serve you well. I wished I had someone that offer me advice. Throughout my poker career I always had to learned the hard way; trials and tribulations. You will learn more from your mistakes then any victory will provide. That's probably the best poker education you can get.